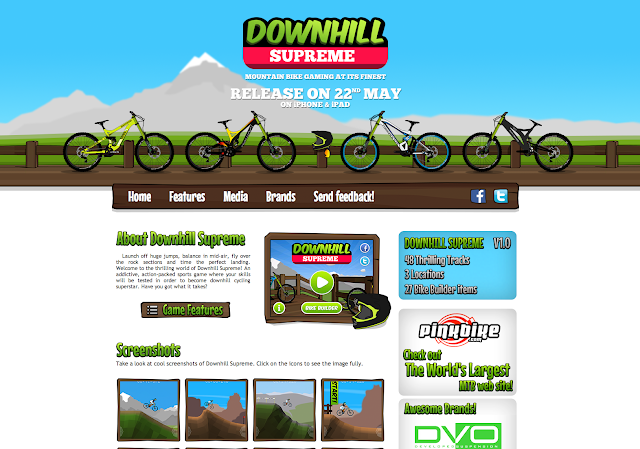 Downhill Supreme - Exciting iOS mountain bike game — Mobers.ORG — Your Daily Source For Mobile FUN! According to the sources, the website as well as the Facebook page reveals details related to the game including game features, related screenshots as well as the associated brands. R.Berzins from ArtRB said, “Some of the features of the game that are likely to attract the eye of gaming enthusiasts include 48 thrilling tracks, three stunning locations, bike builder that lets players build their dream bike by using 27 branded parts and three different control options including tilt, joystick and button.” He further added, “All this would simply means a lot of options for players to have fun the way they like it. In addition, a majority of DCLs would be available free of charge. It's amazing that we met the right people to develop such an amazing iOS game. Starting from physics engine genius to connecting with industry leading companies related to the sport, it’s all been a great experience. We also made many new friends during the period to share our passion on gaming and cycling with.” The ArtRB Studio owner also extended special thanks at the press conference to brands that took active part in the development of the game including DVO Suspension, CaneCreek, Spank, Devinci and PinkBike among others. Details related to pricing were not revealed at the press conference and would only be confirmed at the time of game launch.